Getting to know the elusive Incas, whose trails tell a story as captivating as Machu Picchu. By Alexei Dmitriev | Moss-fringed tree branches fade into the fog on my right. To my left, an invisible stream down below whispers a sibilant-rich refrain: this abyss is not bottomless. The coca leaves I’m chewing are supposed to mitigate the loopy fatigue of high-altitude exertion, but the full benefits seem to be eluding me. Walking in the clouds is not easy. Nevertheless, despite this long uphill stretch in the rarified air, I am euphoric while Machu Picchu-bound on the Inca Trail. Long before Christopher Columbus planted the Spanish flag in South America, the Incas created an elaborate road system called Capac Ñan. This massive network of cobblestone walkways—fortified with walls, equipped with tunnels and bridges, and occasionally flanked by drainage canals—covered some of the most remote parts of South America. Extending from present day Colombia to Chile, the 14,000-mile system linked the Amazon rainforest to Pacific coastal planes via paths threading Andean mountain passes well over two miles above sea level. 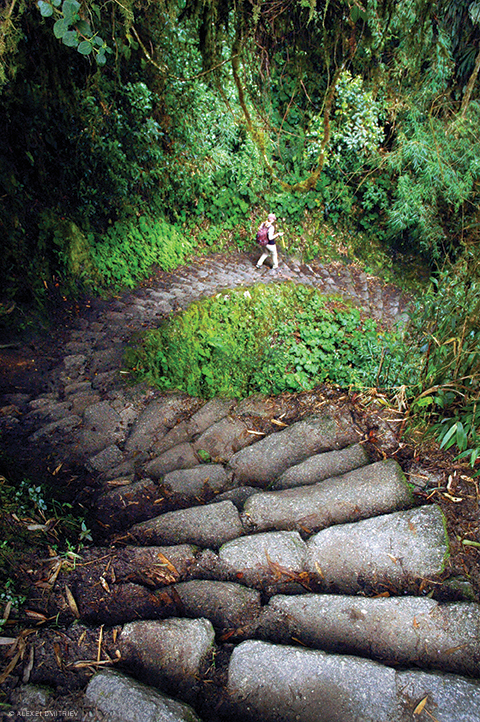 The Inca Trail, now far and away the most popular stretch of Capac Ñan, gets more traffic today than ever before. Back in Inca times, conquered tribes were pressed into service building and maintaining it—but only Inca royals and officials traveling on state business were allowed to use it. Today you might say the situation has flipped. Foreign tourists, the bearers of royal privilege in our era, need to reserve permits far in advance to play out their personal Indiana Jones fantasies, but the local Quechua people can ply the trail freely. Which they do with considerably more ease than I can muster—not to mention speed, even when they’re coaxing pack animals up the steep gradients. On the way to a village called Huayllabamba, a man passed me leading a mule with one hand and carrying a jug of chicha, a beer-like corn beverage, in another. The woman in the saddle was deeply involved in spinning yarn, oblivious to the rather treacherous path underfoot. Given how short-statured the Incas were, the going must have been tough for them as well—but that’s not the impression you get from their descendants, the sinewy and sandal-clad Quechua porters who trot along with all the food, luggage, camping, and cooking gear that tourists require. The Quechua enjoy a personal relationship with the trail. For them it is not just a conduit between the points but more like a fellow traveler that cheers them on. Eufemio, who at the age of 75 must be one of the oldest porters working the Inca Trail, confided that the trail protects him and gives him strength. “Twenty-five miles with 80 pounds over Capac Ñan is like carrying half the weight for half the distance over an ordinary road,” he told me. The Incas were resourceful farmers, experimenting with different crops in different soils and at different elevations to overcome the inherent challenges of high-altitude agriculture. But the Spanish invasion irrevocably destroyed Inca agriculture, and three quarters of land cultivated before the Conquest lies idle today. Yet one can barely hike in the Peruvian highlands without marveling at the Incas’ achievements in humanizing this severe landscape. Judging even from the minor ruins along the way to Macchu Pichu, their aptitude for fitting buildings into virtually impossible places was surpassed only by their feel for a jaw-dropping view. Our final camping site was next to Puyupatamarca, “cloud-level town,” whose stone remnants, true to their name, were cloaked in a fog. When I ventured into the ruins at dusk, a watery melody led me to a cascading arrangement of five bathing enclosures. Having had no bath for three days, I gleefully availed myself of an Incan irrigation system that still functioned five centuries later—in the dry season, no less! With a touch of fear about how the Incan gods might view my irreverence, I crouched under the stream naked and minuscule in the heart of the massive Andean range, feeling closer than I imagined I could to the former inhabitants of this place. And then, the next day, we entered the crown jewel, Machu Picchu—where that feeling was trampled by a horde of visitors in the grips of too many fantasies to keep straight. From the moment Hiram Bingham, assisted by a local Indian boy, “discovered” the site in 1911, archeological enthusiasts have fielded no end of theories about its origins and reasons for its abandonment. The main quality they share is a scarcity of evidence supporting them. To roam the ruins is to hear almost as many hypotheses as there are guides. The sheer impracticality of building a city on a mountain crest far above a reliable source of drinking water spurs a multitude of lofty suppositions that variously endow Incan civilization—in the absence of historical evidence—with transcendent spirituality, a heightened sense of aesthetics, and mastery of functioning socialism. The only written sources at our disposal are Spanish, but since the conquistadores viewed the locals as an impediment standing between them and the treasures, their accounts are long on bias. The names Bingham gave to the buildings—High Priest’s House, King’s Quarters, Palace of the Princess—are still in use, yet remain unsubstantiated. Judging by its diminutive agricultural terraces, Machu Picchu was built not to serve as a working metropolis but as a winter retreat for the enjoyment of life by Inca royals. Fruits, coca, and animal pelts were brought in from the Amazon jungle, corn and other highland crops from Patallacta—whose orderly dwellings and extensive terraces we had passed on the first day of our hike. Thousands of royal messengers ran back and forth on Capac Ñan, between relay stations every two miles or so, to make sure that the emperor could enjoy fresh fish straight from the Pacific. Pedro Pizarro, a cousin and page of the conquistador Francisco Pizarro, had a chance to observe the captured Inca emperor Atahualpa in 1532. The proud and vain Inca leader kept up his royal pretenses even in defeat: he wore garments woven from the soft hair of thumb-sized vampire bats, and would only deign to don any particular outfit once. The Machu Picchu guides embroider the limited available evidence with disproven myths, like the one holding that the citadel was primarily inhabited by “Virgins of the Sun.” This conjecture is based on the small skulls found in situ—overlooking the fact that Incas of both sexes were quite petite. Equally dubious are attempts to portray Machu Picchu as a destination for religious pilgrimage. The academic consensus holds that it was inhabited by the emperor and his circle, with a total population of no more than a thousand. The city appears to have been off limits to commoners, who probably had no idea of its very existence—which probably helped to keep it a secret from the Spanish. For every insight Machu Picchu contains about the lives of its original inhabitants, the ruins have a way of reflecting the attitudes of current visitors even more clearly. This is just as apparent in the facts guides elect to leave out of their spiels. For instance it was a common practice among the Incas to bind the heads of children, resulting in astonishing cranial deformations. These were prized as the height of attractiveness by the nobility—but aren’t “cute” enough for most guides, who are mum about the custom, although the skulls are on public display in a Cuzco museum a few dozen miles away. This struck me as a lost opportunity for some of the wackier theorists, for pointy-headed Incas might blend well with extraterrestrial aliens occasionally evoked to explain how—in the absence of writing, wheels, and iron tools—the giant stones were fit together so precisely. It is indeed hard to imagine the labor required to move those stones. The 16th-century Spanish historian Garcilaso de la Vega related a story told by local Indians about the brute transportation of a giant boulder by some 20,000 laborers over a distance of 45 miles. When it slipped down a hill near the Inca fortress of Ollantaytambo, it allegedly crushed three to four thousand Indians, who perished while carrying out a plan that we are still deciphering today. My egalitarian side insistently tried to pierce the romantic aura of Inca civilization, to the hierarchical and repressive state that thrived on forced labor. But as I took in the sunset view of the “lost city,” my thoughts drifted away from the sacrifice of the masses, and toward an appreciation for the “benevolent despots,” as Bingham subjectively called the Inca royals, who had brought this spectacle into being for me to marvel at five centuries later. Nevertheless, Machu Picchu’s majesty was all too fleeting viewed through the thicket of 3,000 daily visitors, who for the most part arrive by train and bus to stage a one-day assault on the ruins. I prized the four-day hike I’d made in comparative solitude with Zephyr Adventures. In addition to otherworldly views of the Andes, exotic flora, and half a dozen less known but powerfully atmospheric smaller sites such as Sayacmarca and Wiñay Wayna, the trail offered unfiltered insight into the local spirit, without the invasive commentary. Though many of my fellow hikers regarded the first view of Machu Picchu as the ultimate reward, I missed walking the Trail. Adding a new dimension to the maxim that one learns more from the path taken than from the destination itself, I felt that I learned more about the nebulous Incas through my feet. Makes me want to go back and see it again. Next time, using the trail to get there. Wonderful description of an ancient civilization most impact remain. The CapacÑa is a time experience ever. Thanks Alexei.